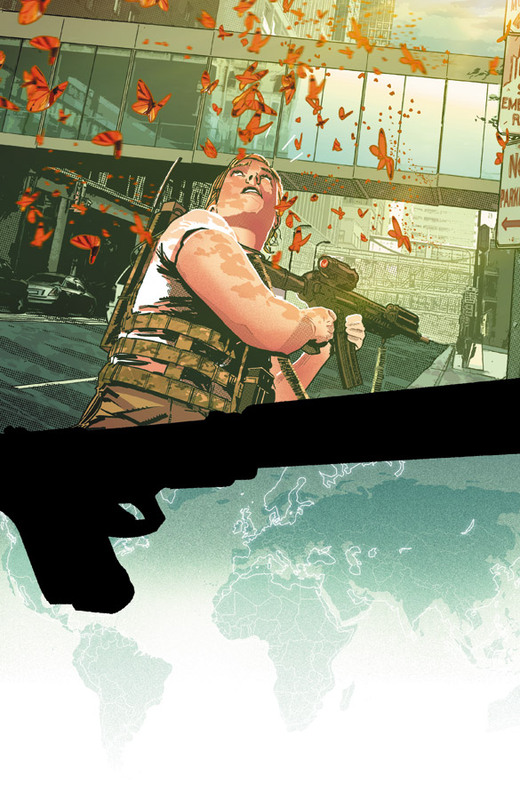 Readers of the Image Comics series THE ACTIVITY, have seen Team Omaha conduct missions in locations as diverse and exotic as the Netherlands, Colombia, Afghanistan, and Thailand. But in THE ACTIVITY #11, Nathan Edmondson and Mitch Gerads take the elite black ops team to a place a bit more familiar: Minnesota. In "The Butterfly Effect," the comic's first depiction of an operation on American soil, Team Omaha must find and disarm a bomb in Minneapolis, without letting the people of that city know they were ever in danger. For writer Edmondson, the issue is a landmark. "THE ACTIVITY makes landfall in the USA," he said. "This is a moment in our story we have reserved for a very particular moment— and as readers will discover, the gravity of the mission in Minneapolis will set the tone for events to come. Events that may reflect the real world and real events in ways disconcerting and dangerous for our operators." Depicting the action on the streets of Minneapolis was no problem for artist Gerads, who lives in the City of Lakes." It's incredibly exciting for me to bring Team OMAHA to my hometown," said Gerads. "Minneapolis is rife with the opportunities of a good action thriller and this issue takes full advantage of that." THE ACTIVITY explores hypothetical missions of the ultra-secret United States Army Special Operations unit the Intelligence Support Activity. To ensure the highest degree of accuracy and realism, both Edmondson and Gerads consult with United States' military special operatives and journalists who have been embedded with special ops teams. One of their consultants is Kevin Maurer, co-author of the bestseller No Easy Day: The Firsthand Account of the Mission That Killed Osama Bin Laden. The team also created a two-issue story "Goat Hunt" that ran in THE ACTIVITY #7 and #8 that was co-plotted by actual U.S. Navy SEALs.